Thinking about buying a new android phone but confused after seeing so many choices? After seeing features of Xiomi Redmi Note 3, you'll buy it without giving a second thought. 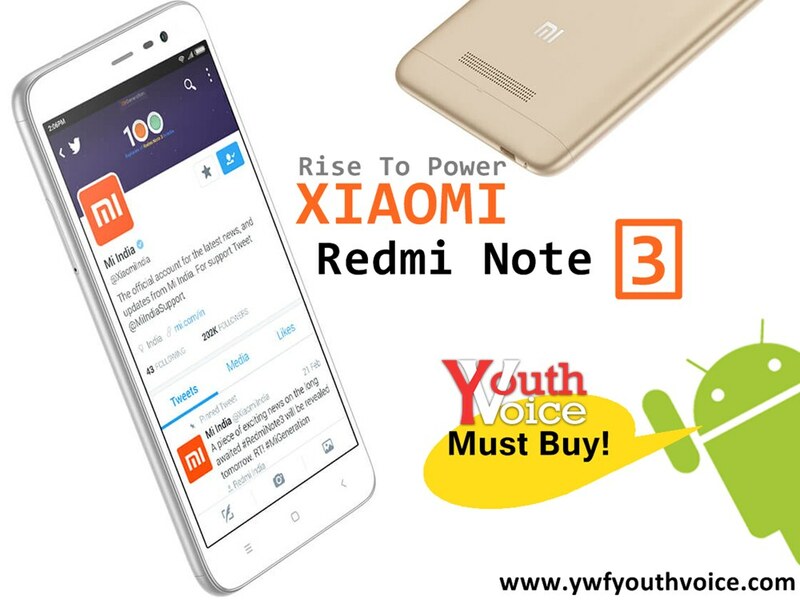 Read this to know about different versions of Xiomi Redmi Note 3, specifications, price in India, why to buy it, its positive and negative points. Thinking about buying a new android phone but confused after seeing so many choices? After seeing features of Xiomi Redmi Note 3, you'll buy it without giving a second thought. Youth Voice recommends this latest Xiomi android mobile phone to its users. Xiaomi Redmi Note 3 is available in two different versions based on Internal Memory and RAM. One has 2GB RAM + 16GB internal memory, second one has 3GB RAM + 32GB internal memory. 32GB version is also referred as the pro version of Xiaomi Redmi Note 3. The new face of performance: Mr. dependable like Rahul Dravid. Real fast processor best for high end gaming. Unlocks in an instant: smoother experience. Too fast and accurate fingerprint sensors making your mobile secure. The premium touch of metal providing strength and cool looks. Go big with 4050mAh battery. Makes connection faster than any phone (wifi, 4G). Capture the world the way you see it. You have read all the positives and pros about this phone till now, you may be thinking what's negative about it? Well my friend there is nothing bad in this phone, except the users buying 16GB version may not be able to enjoy freedom of dual sim as one slot is hybrid and 16GB users might use it for external sd card. Everything else is perfect! Anyone will think of the price to be high as Rs. 25000 after reading these features but guess what the price is not even half of it. Buy Xiaomi Redmi Note 3 on Amazon. Buy Xiaomi Redmi Note 3 on FlipKart. Buy Xiaomi Redmi Note 3 on SnapDeal. Buy Xiaomi Redmi Note 3 on official MI website. Let us know in the comment section what you think about this phone and what do you expect from upcoming Xiaomi Redmi Note 4.